"Working independently, we individually will never have enough resources for IT to meet the collective challenges of supporting a growing student population, addressing emerging cybersecurity threats, or optimizing the use of administrative computing. But addressing shared needs together- dealing with repeatable, overlapping tasks in a common way - frees IT staff in departments to work on the specialized needs in their areas. This is a formula for progress." 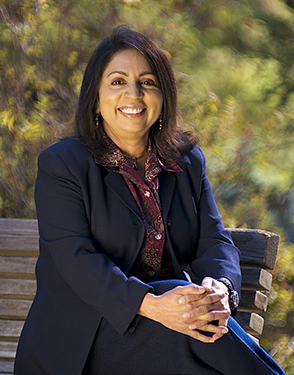 Viji Murali joined the University of California, Davis in August 2014 as Chief Information Officer and Vice Provost of Information and Educational Technology. Ms. Murali has primary responsibilities for the foundational technologies that enable academic, research and administrative computing on campus, including the campus voice and data networks, the campus data center, email services, and identity and access management. In addition, she has responsibility for mission critical student technology and academic technology systems, and indirect responsibility for all administrative technology on campus. Since joining UC Davis in August 2014, Ms. Murali has been working with the Chancellor, Provost, and campus stakeholders to improve coordination, control and efficiency of campus technology investments and operations. Ms. Murali has been designated by the Chancellor as the UC Davis Cybersecurity Responsible Executive and oversees information security for the UC Davis campus and UC Davis Health, As a member of the University of California IT Leadership Council, she works with the CIOs of all UC campuses and health systems to articulate goals and seek opportunities to address systemwide IT challenges. With three decades of experience in the field of information technology, Ms. Murali has led major initiatives in research, high-performance, instructional, administrative efficiency, and enterprise computing, as well as telecommunications. From 2007 to 2014 she was Vice President for Information Services and CIO at Washington State University, where she was responsible for academic and administrative computing, convergent technologies (telecommunications, wired and wireless networks, VoIP, video), distance learning technologies, and strategic planning and policy development for the IT enterprise. Previously, Ms. Murali was the Vice President for Information Technology and CIO at Western Michigan University (WMU) for eight years. WMU launched major initiatives for faculty during her tenure, including the Laptop initiative, Teaching with Technology grants, Internet2 grants, and wireless enhancement projects. She is active in local and national organizations, and has participated in many conferences as a keynote speaker and panelist. In 2003, both the CIO and CXO magazines profiled her for her leadership abilities. In October 2005 she was given the "visionary award" for Excellence in Technology by the Governor of Michigan, and in 2009 Computer World named her one of the Premiere 100 IT Leaders. More recently, Northwest Asian Weekly selected Ms. Murali as one of several Women of Power in Technology. She has served on the boards of the Idaho Regional Optical Network (IRON) and Pacific Northwest Gigapop (PNWGP). In 2017, Ms. Murali was awarded an NSF grant and serves as a co-principle investigator on the grant with Professor Bishop to develop network security strategies for protecting the Science DMZ. Ms. Murali has a bachelor’s degree in biology and chemistry, a master’s degree in organic chemistry, and four years of graduate research experience in organic chemistry, all accomplished in India, as well as a master’s in computer science from the University of Arizona, Tucson.